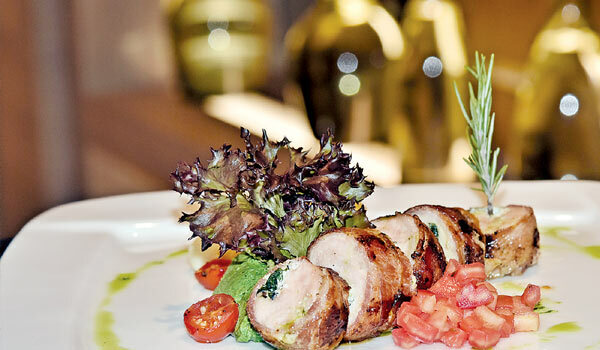 AS winter sets in, Tuscany, the Italian restaurant at Trident Hyderabad, has changed its menu to bring in a lot of comforting delights cooked with herbs, cheese, sun-ripened seasonal vegetables and, of course, olive oil. Chefs Manik and Ameya have curated the new menu and the booklets come wrapped in raw silk jackets. The name Tuscany itself brings to mind quintessential delicacies like ravioli and lasagne that central Italy is known for. What makes these culinary delights more appealing is the use of fresh and dried herbs and a whisk of wine. Elaborates chef Manik, a�?Other than regular herbs such as rosemary, thyme and basil, we use lemon balm and tender mustard shoots, especially while cooking fish for that citrus flavour.a�? The chefs sent us a plate of Tuscany Lobster Bisque. The tomato sponge was served with clotted cream and cherry tomatoes laden with hot lobster soup, rich and thick in consistency. It was a bowl of molten warmth with all the flavours in place. This was followed by Wild Mushrooms and Goat Cheese Tortellini served with porcini cream, toasted hazelnuts, wine and truffle oil. The mushrooms were fresh with their distinct earthy flavour intact. The ring-shaped pasta tasted really well with the cheese. We recommend Beetroot Risotto. Deep pink in colour served with the melting chevre, the dish tasted just right. a�?As winter approaches, one craves for creamy, cheesy and filling food. Thata��s why we added beetroot in risotto,a�? adds chef Ameya. They have included 15 dishes to the menu based on customer feedback. The restaurant takes pride in using a variety of cheeses like Parmesan Reggiano Parmegiana, Gorgonzola, Picorino, Parmesan Grana Padano and more, imported from Italy. The ambience is straight out of a Tuscan villa in Florence. Whether it is the hand rolled spaghetti tossed in ripe pelati tomatoes or the freshly baked Milanese pizza from the red-brick oven, you get what you see from the vantage point of your dining table. One can wash down the sumptuous dinner with a glass of Danzante Merlot or Pitars Pinot Grigio. Both the red wines are from Italy. Baileys Irish Cream or Chinkara Chardonnay are among the must-try ones too. We finished the dinner with Lemon Tart and Cassata with Raspberry Coulis and Nut Meringue.